Embrace your enterprising spirit and get the most out of a multi-needle machine with Baby Lock. With 10 needles and a speed of 1,000 stitches per minute, this machine is ideal for anyone looking for industrial power in a home embroidery machine. 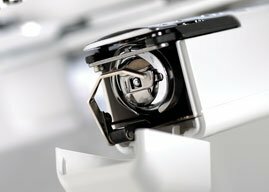 Baby Lock IQ Technology™ powers smart, user-friendly features, such as the NeedleCam™ Digital Camera, by working with the "brain" of the Enterprise to achieve the results you desire. The Enterprise is perfect for your most detailed embroidery designs and can help any embroidery business grow. With the Baby Lock Enterprise you get both quantity and quality. With 10 needles, the Enterprise gives you the opportunity to take on more than ever before. Large designs, multiples, or even gorgeous 10-color designs can be embroidered with minimal set-up or thread changes at a speed of 1,000 stitches per minute. If you think 10 needles is a lot to handle, the Enterprise has just the thing for you. This machine comes with 10 built-in LED spool stand lights to help you keep your threads in order. The LED lighting on each spool changes to match thread colors and signals when a spool needs to be changed. 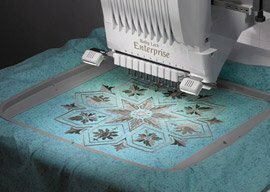 With over 16 million colors, the Enterprise’s high-definition TrueView ASV LCD screen brings your embroidery designs to life. Images are displayed with more clarity than ever before. With adjustable thumbnails and the ability to magnify your designs on screen up to 200%, the Enterprise makes it easy to see any design flaws before you stitch. Thanks to the NeedleCam digital camera, your needle area can be clearly shown on the LCD screen. With this view, you can see exactly where the needle will drop. 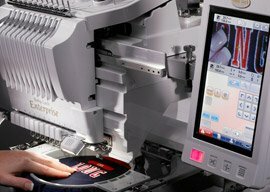 Also the Enterprise recognizes the embroidery positioning stickers and positions the embroidery automatically so you can place every design with extreme precision. With the Enterprise editing features, you can combine, reposition, resize, rotate and mirror your designs and watch as the changes happen instantly on the LCD screen. Alter designs individually, or group design elements together to quickly move or edit the design. The optional 14" x 14" (360mm x 360mm) jumbo hoop is perfect for large projects like jacket backs and quilt blocks. The jumbo hoop is activated through the Palette 9 embroidery software. Combined with the Enterprise, Palette 9 becomes the command center for your embroidery project and provides the ability to link up to 4 Baby Lock Multi-needle machines together. Linked machines can embroider the same or different designs. Baby Lock IQ Technology is what makes Baby Lock machines so smart and efficient. 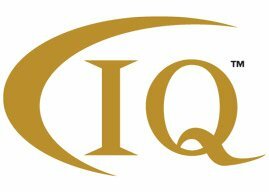 IQ Technology works with the "brain" of your machine to help achieve exactly what you desire.